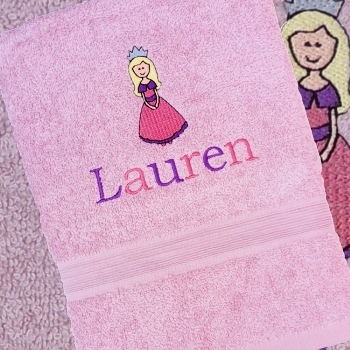 Childrens dusky pink cotton towel with embroidered name and pretty princess motif. This bath sized towel is 100% cotton. Swimming or Bath Towel measuring 75x125cm. Personalised with your choice of text; A name, initials or nickname. Select the letter font style you prefer for the text. The name is sewn in your choice of purple/pink alternating thread or all pink or all purple.